Trust falls and circle games are wack. Luckily, a crop of companies now offer corporate team-building classes with counterculture cred. Will tagging a freeway underpass with your cubicle mate bring you closer together and increase productivity? There’s only one way to find out. Pass the spray paint and let’s get busy in this off-site. Silicon Valley heavyweights like Google, Adobe, and Intel have turned to Syncopate to improve esprit de corps through DJing and remixing. World-renowned turntablist DJ Quest and electronic musician Christopher Willits teach teams to make tracks in GarageBand, then demonstrate the art of mixing and scratching with Serato, a DJ software package. Each event culminates in a showcase of tech-sector workers getting to (having to?) break out their bangin’ beats. 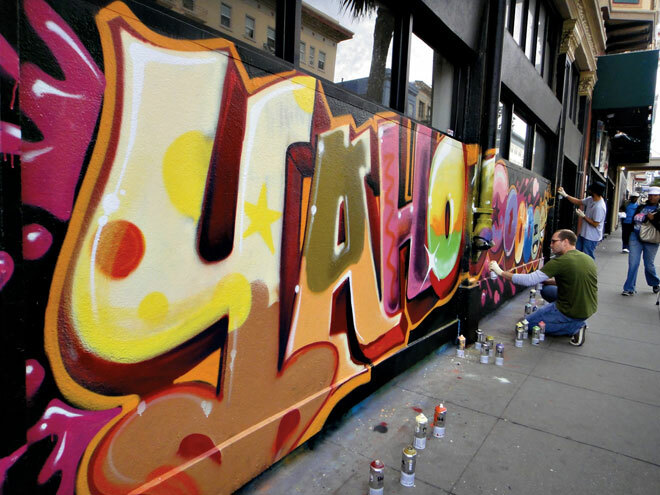 This San Francisco art gallery hosts graffiti workshops that have helped build camaraderie at companies like Yahoo, Genentech, and Facebook. Veteran street artist Nate1 offers tips on shading and tricks for spray-painting shapes and lines, then has groups collaborate to create a mural, usually of their company’s name. Break dancing is the newest team-building activity offered by this British company, which also leads art and music workshops. Instructor B-Boy Rival teaches office jockeys from places like Toyota and Adidas a variety of basic moves. Then he separates participants into two crews that each choreograph and perform a battle routine. Yo, Bob from accounting—you got served!